One of the country’s largest plant hire companies have been fined £100,000 after admitting flouting health and safety rules which left a crane driver with crippling injuries. At NAHETS Safety is our primary concern. John Young suffered severe spinal injuries after the cab of the crane fell through the air and crashed onto the roof of the Croydon Park Hotel on June 2, 2007. He has been left unable to return to work more than two years after the tragedy. Passers-by reported watching the crane’s arm topple backwards 200 feet in the air and break free from its base before crashing onto the roof of the neighbouring hotel. The crane was building the Altitude 25 apartment block for Howard Holdings when the accident happened at around 2.20pm. Three other workers were left stranded on the top of the crane’s base for five hours as firefighters from Croydon fire station launched a massive rescue operation. Select Plant Hire Company Ltd, based in Dartford, Kent, admitted breaching regulation 9(2) (b) and 8(1) of the Lifting Operations and Lifting Equipment Regulations 1998; regulation 9(2) of the Provision and use of work Equipment Regulations 1998 and; section 3(1) of the Health and Safety at Work etc Act 1974. As well as the fine, the company was ordered £15 victim surcharge and the costs were £33,196. A large crane lies in the middle of a large New York City intersection. Ramadan Kurtaj was remembered yesterday at the spot where a construction accident took his life. His parents, Uke and Reyve Kurtaj, were granted a visa from Kosovo, and traveled to New York for the anniversary of their sons death. A picture of Ramadan was placed in honor of him at the construction site. “It’s a big loss for me, it’s hard for me. I lost my son, 27 years old, it’s very hard,” said Uke Kurtaj through a translator. Ramadan wished to bring his parents to New York, but not because of his own death. Construction workers Ramadan Kurtaj (27) and Donald Leo (30) were killed last May 30 when the top part of a 200-foot crane crashed down on a Manhattan residential neighborhood. Their deaths followed an similar crash on May 15, 2008, where seven died in a crane accident. Investigators have said a bad weld failed in the collapse. The workers’ families have sued the crane makers and prosecutors have launched a criminal probe. Their lawyers say the crane was put into service despite a history of poor maintenance and botched repairs. NAHETS member school, Southern California College of Construction (SCCC), recently enhanced its crane training program. Here is a statement from Campus President Henry Salgado . . .
With the high demand for certified, safety conscious, and well-rounded crane operators, we decided to revamp our current three week crane program to a six week program. Upon completion of our six week program, our operators will be prepared to take NCCCO small and large telescopic boom certifications, and they will also receive a Certificate of Achievement from The Crosby Group. Students will be trained in different rigging practices such as confined space movement and detaching rigging blocks for lifting purposes. Our purpose in expanding our crane program is to ensure that our Crane Operators are leaving with an even greater understanding of safety and proper operations for crane and rigging practices. Over the last 6 months, we have enjoyed various publicity opportunities here at NAHETS. Some of these include visits with Trimble, Inc. and Volvo, meetings with companies in Saudi Arabia and Estonia, a trip to Hawaii, NCCCO workshops, and more. Recently, we had another success that ended up being the perfect end to a great year for NAHETS . . . It all started on Halloween–Chris Cannon, Director of Training and Curriculum Development for the National Association of Heavy Equipment Training Schools (NAHETS), received a message from Patrick White, a freelance writer for Landscape Construction Magazine, asking Chris to call him. Chris was a little surprised, as he never had any previous contact with Patrick. Chris called him back, and the rest is history . . . The article is basically an overall summary of what NAHETS does. Patrick asked Chris about NAHETS training and curriculum; i.e., he asked what NAHETS teaches at its campuses, what kinds of heavy equipment are used, about safety and standards issues, about the experience of being educated at NAHETS campuses, etc. Chris was a previous heavy equipment operator and foreman and was able to draw upon past experiences, in addition to his current employment with NAHETS. Currently, the article is only in print in the December 2007 issue. There may be an online version up shortly; if that happens, we will let you know. You can visit the Landscape Construction Magazine website to learn more about the magazine. The magazine offers free subscriptions to individuals and companies related to the construction industry. What do you think of when you hear the words “heavy equipment” mentioned? What images enter your mind when you come across the words “heavy machinery?” Or perhaps you have never thought much about those things. Typically, large pieces of equipment such as cranes, bulldozers, excavators, backhoes, loaders, and others are associated with those terms. And although these are considered “heavy equipment” and “heavy machines”, one could wonder if larger machines exist. They do. If you think cranes and bulldozers are big, take a look at the biggest moving man-made machines. 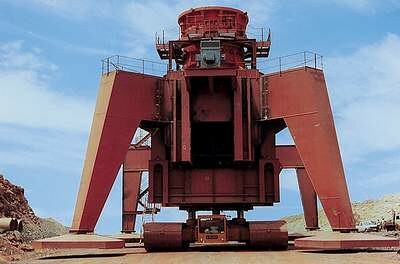 First is the giant bucket wheel excavator , a.k.a. 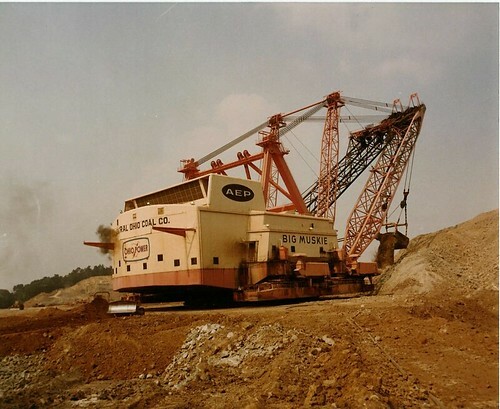 ” the bagger 288.” It was built by Krupp in Germany of 1978. This machine is 984 feet long, the equivalent of about six Olympic-sized swimming pools in length. It weighs about 91 million pounds, the size of about 380 Blue Whales, which is the largest animal on the planet. It moves on treads to different open-air mine sites. In 2001, last time it went on one of these expeditions, it traveled 22 kilometers in a straight line. Despite how huge and impressive the bagger 288 is, it just would not be fair unless it had a competitor in size. In Lichterfeld, Germany there appears to be another “biggest” moving man-made machine. 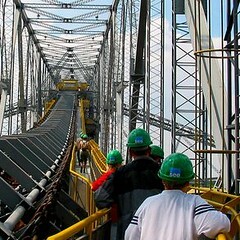 This colossus of a machine is called the Overburden Conveyor Bridge F60. Although it weighs less than the bagger 288 (only 11,000 tons instead of 45,500), its length is untouchable-502 meters, or 1,647 feet, (compare 300 meters, or 948 feet for the bagger.) 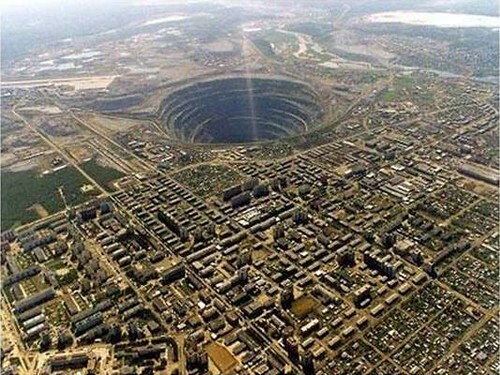 It is also 202 meters, or 663 feet wide. It was built in 1991 by VEB TAKRAF Lauchhammer. After only 13 months in operation, it was shut down for “energy-political” reasons. To get an idea of how long this machine is in relative terms, if the Empire State Building fell over its length would fall about 200 feet shorter than that of the F60. If the Sears Tower fell over it would be less than 100 feet longer than the F60. Note this comparison includes the lightning rods and antennas of the Empire State Building and the Sears Tower, which if it did not, the F60 would be longer in length than the height of both buildings. Also note that the Sears tower is said to be the tallest building in the world measured from ground to pinnacle point. Below is a picture comparison between the F60 and the Eiffel Tower. After seeing how enormous these machines are, we have not seen exactly what they can do. A last look at the heaviest of heavy machinery will give us a glimpse of what these massive human-built machines are capable of. 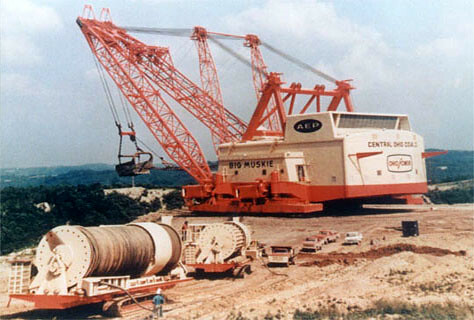 Before the last two machines were built, in 1969 “The Big Muskie” owned the show and was considered the largest moving man-made piece of machinery. The Big Muskie could move 39 million pounds of earth every hour. It could uncover coals seams up to 150 feet into the earth’s crust. It could “swing its boom” 600 feet across the landscape. It remained in full-production until 1991, when it was shut down. It was later scrapped and only its enormous metal bucket still remains as a roadside attraction in Reinersville, Ohio. 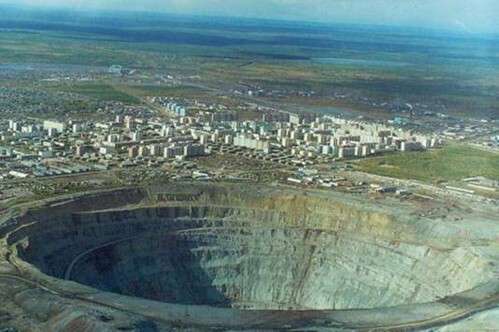 An even more impressive illustration of what these man-made machines can do is depicted in looking at the largest man-made holes in the world. 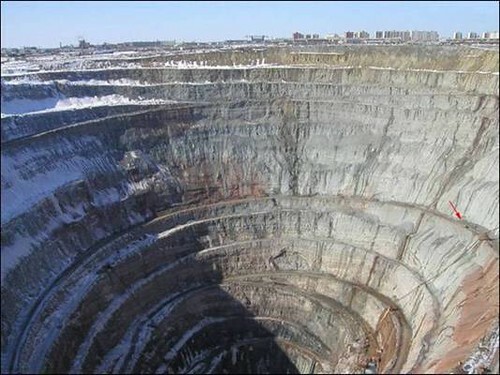 The diamond mine in Siberia is 525 meters (1,722 feet) deep, and is 1.25 kilometers in diameter, 0r about 8/10 of a mile. The red arrow in the picture directly above is pointing to a huge mining truck. It takes the truck over two hours to get from the bottom of the mine to the top. Although the uses of these pieces of heavy equipment are not as common as the backhoe you see on the side of the road, or the crane next to your work building, they are nonetheless intriguing spectacles for the human eye and mind-with a significant purpose. What makes them even more impressive is the fact that they are built and operated by humans. Without the training of heavy equipment operators, the construction of these machines is useless. And whether it is a backhoe, crane, or the Big Muskie being operated, the credentials to operate must be the same: professional training and education, in-class and on-site instruction, certification and licensing, safety, and standards. This is the NAHETS (www.nahets.com) vision; and although you will not find the bagger 288 at NAHETS training schools, you will find the above credentials. This is our mission-to provide society with the “heaviest” of the heavy equipment operators. The Georgia School of Construction, a NAHETS member school, was featured on the local Fox 5 Affiliate. Brett Martin, the Fox 5 “Road Warrior”, visited the field site early in the day to watch of the training exercises of our students. Highlighted in the two-minute news clip was the fact that students come from all over the nation, from Maine to the Virgin Islands, to attend the Georgia School of Construction, with the intent of gaining various certifications in heavy equipment operations.